Jay Ward is responsible for putting on television numerous beloved cartoon characters, characters that have found a life far longer than their initial television run. From Rocky and Bullwinkle to Mr. Peabody and his boy Sherman, to Dudley Do-Right, the characters he helped create have continued to please audiences in new and different incarnations. The latest character up for rebirth is George of the Jungle, whose new cartoon series began this past weekend on Cartoon Network. 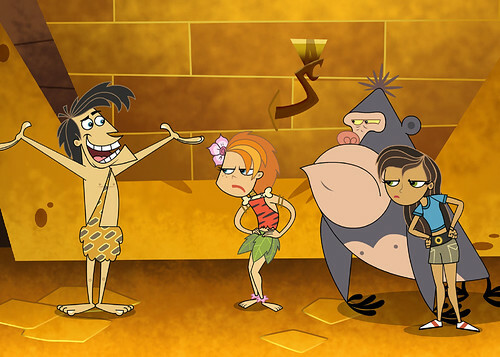 Sticking with the title of the character and the original series, this new George of the Jungle is a fun little cartoon which, while it may not live up to the original, still provides ample amusement. The series follows George, king of the jungle and general goofball, as he gets into and out of various scrapes. 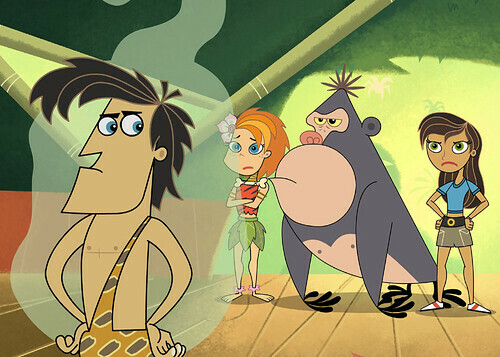 Ape is still around as George's right-hand simian, and the theme promises that Shep the Elephant will make an appearance (though he was absent from the premiere). Each 30 minute episode is comprised of two 11 minute, unconnected stories. The ones in the premiere episode are entitled “Brother George” and “Rebel Without a Claw,” and are enough fun to make one want to tune into future episodes. They may be nonsensical and foolish, but it is a good-natured sort of nonsense and foolishness. In “Rebel Without a Claw” George, who is the champion of the smaller animals in the jungle, convinces all the larger animals to eat vegetables rather than creatures. Meanwhile, his two companions Maggie and Ursula (this marks a change from the original series which had Fella and Ursula) convince all the little creatures to stand up for themselves. This rapidly causes a drastic change in the jungle, with cute little bunnies donning biker jackets and riding hogs (warthogs), while the large predators turn into flower children. By the end of the 11 minute story everything is back to normal, with the predators going after the prey and George doing his best to fight for the little guy (nothing ever really changes from one episode to the next in George's world). While the look of the series is relatively standard cartoon, it gets the job done and neither detracts from nor overshadows the plot. The classic George of the Jungle theme song has been remixed for the series, in what seems to be an attempt to modernize it. It is still amusing, but less so than it once was (though the younger set would probably find the old version horribly dated). New episodes of George of the Jungle can be found on Cartoon Network at 7:30PM on Friday nights, and they are repeated throughout the week. People who remember the original series will not find this one as enjoyable, and purists will almost unquestionably decry the changes, though children will most likely find it very accessible and enjoy watching.